The Cumberland & Dumfriesshire Farmers Mart P.L.C. 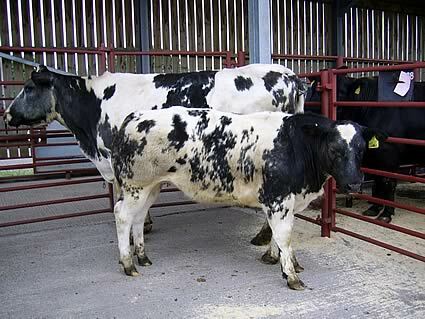 had forward 145 store cattle and 84 breeding cattle at their fortnightly sale at Longtown on Tuesday 25th May, 2010. Store cattle - again small grazing cattle met a buoyant trade but bigger cattle were harder to cash. Top price of £825 for a Limousin bullock from Thomas Holmes, The Crook and for a Charolais bullock from J.T. Fleming & Son, Falnash. Breeding cattle – a shortage of heifers with calves on offer saw them sell to extreme high rates, with older cows also selling very well. Top price of £2,050 for a British Blue cow with British Blue heifer calf from G. McGimpsey & Co., D’Mainholm. Limousin £825, £730 The Crook, £680, £625 Albierigg, £615 The Side. Simmental £755 Archerbeck, £510 Old Irvine. Welsh Black £615 Dairy House. British Blue £595 The Crook, £570 The Side. Angus £585 High Plains, £570, £555 Leahaugh. Simmental £740, £670, £620 Archerbeck. British Blue £685, £615 Chapeltown. Charolais £675 Archerbeck, £665 Shankbridge End and Archerbeck, £655 Archerbeck, £625 The Hagg. Limousin £650 The Crook and West Craigs, £645 Chapeltown, £640 The Ash, £625 Solmain. Blonde d’Aquitaine £640 Great Bidlake, £555 Chapeltown. Simmental cow with bull calf £1,220 Palaceknowe. Limousin cow with bull calf £1,200 D’Mainholm, £1,150 Deadwater, £1,080 Taylorburn and Deadwater, £1,050 Campingholm. British Blue cow with bull calf £1,100 Standingstone Rigg. Shorthorn cow with bull calf £980, £880 Minsca. British Blue cow with heifer calf £2,050, £1,320 D’Mainholm. Limousin cow with heifer calf £1,280, £1,100, £1,050 D’Mainholm. Simmental cow with heifer calf £1,020 D’Mainholm. British Blue heifer with bull calf £1,800, £1,720 Mossfoot. Simmental heifer with bull calf £1,380 Palaceknowe. Simmental heifer with heifer calf £1,200 Church Style. Limousin bulling heifer £775, £740 Doorpool. British Blue bulling heifer £750 Doorpool.